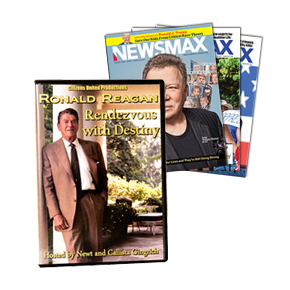 In Rendezvous With Destiny, you'll celebrate and commemorate Reagan's life and legacy. You'll see the top moments that defined the Reagan presidency. In fact, you'll revisit his two terms in office and recollect his proudest achievements and greatest challenges. You'll also hear some candid interviews and private anecdotes from Reagan's "inner circle": his closest friends, political confidants — even some of his former adversaries. But first, let's take a trip down memory lane . . . Believe it or not, during his eight years in office, President Reagan faced many of the same problems we're facing today. It was a time filled with turmoil and uncertainty; the American people were dispirited and the economy was sputtering. So what did the president do to pull the country out of the financial gutter? You'll find out exactly what he did when you watch Rendezvous With Destiny. And the question remains . . .
YOU be the judge — when you watch Ronald Reagan: Rendezvous With Destiny.